Despite my plea last week for a personal assistant, I got bupkis. Though many of you commiserated and admitted you could use one, too. Yet, no one came forward and offered to take on the job. Sigh. Which leaves me back at the drawing board. As such, I am spinning myself into a tizzy, barely keeping up with the impending holidays. Mind you, I used to be extremely organized and efficient, running my little ship like Captain Von Trapp ran his household. In fact the only difference between us that I can see is that I am nowhere near as handsome as Christopher Plummer (aka, the Captain), and I don’t own a whistle. I used to always be on top of the holidays, starting my planning early. I’d have my Christmas and Chanukah cards sent out by the Sunday after Thanksgiving, thank you very much. Fast forward to this year, and my holiday cards are still sitting on the kitchen table, waiting to be addressed, etc. 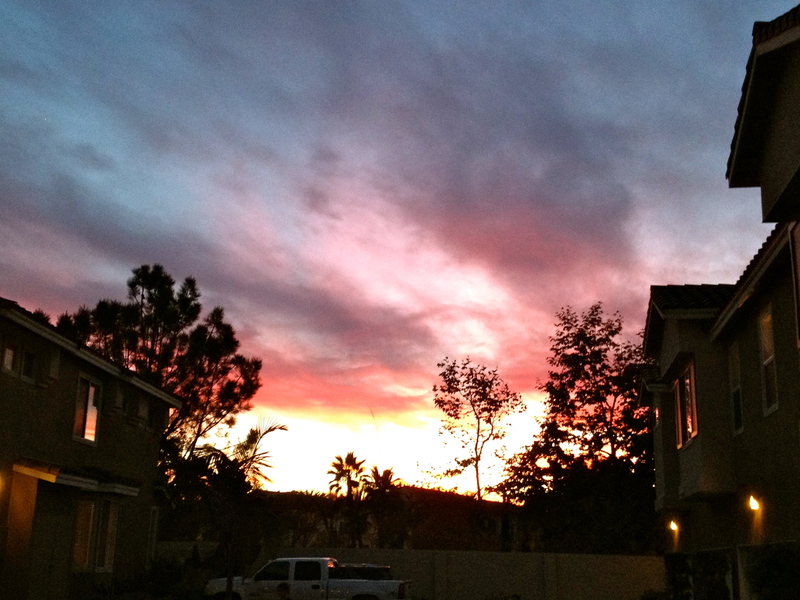 Sunrise, Sunset: Here in Southern California, we’ve been having the most spectacular sunsets of late. Here’s a photo of one that I took with my cell phone. I don’t do it justice, but you get the idea. Trust me, it was breathtaking. On Writing: When I write, I love the feeling of words pouring out of me, and sometimes I can’t type fast enough because the words spring forth so quickly. To me, writing is crafting words together in order to turn them into a story. Like working with clay to mold a sculpture. I knead the clay, pinching some off here, making an indentation there. I stretch it on this side and nip it on the other. And finally, I’m done. Through my fingers, I feel that clay turning into my finished product. And then, I post. For me, the passion for writing sometimes is greater than the passion for eating, breathing and sleeping. “Sometimes voids cannot possibly be filled. Sometimes emptiness needs to remain empty. Final thought of the day: Another year of writing my heart out. Another year of molding words together, and I know I couldn’t have done it without you. It means the world to me when you stop by. So, thank you very much! I am always amazed when I stubble on a great sequence of words.. Is it geeky that I either copy them down, or cut and paste into document…? Happy New Year, Mistress Monica. I hope you get a PA soon. Happy New Year to you, too, Brenda! And no, it’s not geeky at all. In fact, it’s the right thing to do! Happy Holidays to you, Lady Monica! I too, am a sucker for writing and the power of words. Loving Harper’s quote about not missing Life! Live Life as an Art Form, deliberately and passionately. Create something beautiful in the process. SomerEmpress, I hope you’ve been having a wonderful holiday. And I’m so glad you enjoyed Valerie Harper’s quote. I am certainly going to do my best to abide by that sentiment and not start planning the funeral. Happy New Year, my friend! No M’am! We folk above ground are meant to live, so let’s be about the business of doing so. Be Well, Live Well. Amen, SomerE! Glad to have met you in the blogosphere. Each one is better than the last. I love getting to know these bloggers. You are all like family, I feel like I know you well. We have a nice community here! Hope you got a bit of a break this week! Like now, with this, with you. Yes, this is a great group of quotes and a wonderful reminder. Thank you so much, Linda, and I’m thrilled you took the time to comment on my blog! I, too, love metaphors. So glad you enjoyed my post. My daughter didn’t attend an arts school, by the way. She earned a degree from Northwestern University. Apparently, Baryshnikov’s daughter attends too and is a senior this year. Maybe he’ll be invited to speak again, at her commencement. Doubtful though, as they do try to have someone new speak every year. Cheers! Your passion for stringing words and ideas together resonates on your posts, Monica, and we’re all the better for it. Thank you! Here’s to a beautiful Christmas and a Happy New Year! Thank you, Debbie. Happy Christmas! Hope it’s a joyous one! What a gorgeous sunset! — and such a perfect image for a post re: the things that keep you (us) going as writers. Great quotes, here, Monica. Wishing you a wonderful holiday and a New Year filled with even more inspired/inspiring thoughts. Deborah, I caught the tail end of the sunset. You should’ve seen it in all its glory! Unfortunately I was walking the dogs and looking down at the time. By the time I realized and ran home for the camera, well, you can see the results. Happy New Year, my friend! Pura Vida from Costa Rica, Monica. I saw this, and had to write because I so love what you have said about the written word. Although I now spend a month crafting my posts – I miss writing regularly – it is the joy of letting the words flow through me that I most look forward to, it is a cleansing process, cathartic and fantastic. I watch my brain sometimes and see how ideas pop in and out, watch my reaction to a book and how slowly the emotional connection translates to the rest of me, right down to my finger tips. You said it best. While we are in holiday mode over here, we are also reflecting on the meaning of life. I lost my mother in -law yesterday. The whole family was able to be together and talk about her amazing life. It is somewhat somber but there is so much joy. We now go back to a funeral and some of the family will leave early to plan everything. Life is short and doing what we love truly matters. Have a wonderful and blessed holiday season, along with young Oliver and Sir Henry. Oh, MM, I’m so sorry for your loss! It’s always painful, but sometimes it seems more so around the holidays. I’m glad to hear you and your family can come together and share your memories. That’s so important to do, and part of the mourning and letting go process. It’s good to know you appreciate what I wrote about writing. You should do when I come across something that resonates for me: copy it down and keep in a safe place on your computer or by your desk. I always enjoy going back and re-reading these quotes. I look forward to reading your next post soon! Did you see Baryshnikov? Once, I was madly in love w/ him! (in my ballet diggin’ days)!! Love this: “”For me, the passion for writing sometimes is greater than the passion for eating, breathing and sleeping.”” YESss. I saw Baryshnikov from afar. It was a huge commencement and the graduating class had the best seats. Go figure. I’m so glad you like my words about writing. I meant it from the bottom of my heart! I love the Baryshnikov quote. That’s one I should post at my desk. And the Valerie Harper quote goes right along with it. My goal for the year… to make every day count. Thanks for the inspiration! Beautiful sunset photo, too. I know, Shary. Totally agree. Great quote, one I want to remember and live by myself. Thanks for reading! I like the salt on popcorn one, too. Thoughtsy, I love, love, LOVE that line of yours. So very clever and you must use it in a longer story, whether a novel or your memoir. It’s brilliant! Thank you for digging out from under the pile of “to-do” to share these delightful turns of phrase with us. Happy Holidays! Lisa, and thank you for your invaluable comments, which add so much to the conversation. Enjoy the holidays! I thank you for your heartfelt messages, your crisp writing with nary an unnecessary word. I enjoyed your Lightening in a Jar series this year which sent me back to a time defined by our latest relationships. I remember Mikail Baryshnikov’s quote and find it so down to earth for an artist whose head is in dance. Good luck on the Christmas cards, but really, if folks want to keep up with you, you are just a click away…right here. Merry Christmas, Monica. Baryshnikov spoke with grace and humor. I was surprised that he was selected to be keynote but also impressed. It probably was in his favor that he has a daughter attending the school. Thank you so much for all the nice words about my blog and writing. Have a wonderful holiday, Georgette!